Welcome to the Juicer.co.uk juicer shop! We have teamed up with Amazon to bring you the latest listings of the most popular juicers from manufacturers such as Philips, Vonshef, Andrew James, Russell Hobbs, Duronic, Matstone, Kenwood and Sage by Heston Blumenthal. 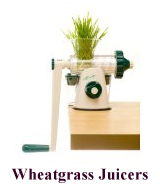 Please click an icon below to see listings for whole fruit juicers, citrus presses, wheatgrass juicers or juicing recipe books. 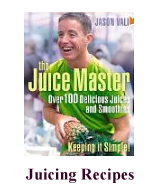 How much do juicers cost? 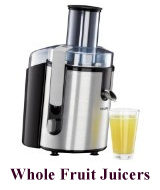 The cost of owning a juicer varies with many whole fruit juicers available under £50 or even £40. Towards the £100 mark you will find that the juicers are of a good standard and will deliver great juicing for years to come. What can I use a citrus juicer for? Citrus juicers allow you to extract the lovely juice from all your citrus fruits such as orange, lemons, limes, grapefruits etc. Simply cut your citrus fruit in half and press down on the reamer. 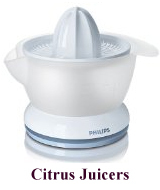 The popular Philips electric citrus juicer press costs about £20. Where can i find out about juicers for my business?